CityCenter is a 76-acre urban resort destination located on The Strip in Las Vegas and developed by MGM MIRAGE®. It represents the next evolution of Las Vegas. When completed in 2009, it will be one of the great urban places of the world, a reflection of the best of the life that we’re living today and tomorrow. It will be a place of continual evolution, richness and diversity—a place people of all kinds will desire to visit, and become a part of. Across the country and throughout the world, people are rediscovering the excitement of the city—as a place to live and a place to escape to. The city is where the people are, where the action is, and where all that’s thrilling and new comes together—whoever you are. Las Vegas will soon have its own urban core— a 76-acre city-within-a-city that’s destined to redefine the skyline. It will be an urban setting unlike any other in the United States. Or, really, anywhere. CityCenter. CityCenter could only exist in Las Vegas—and only MGM MIRAGE, the world’s premier developer of destination resorts, could build it. No other developer has the vision to realize such a forward thinking project with the same care and attention—or the experience to offer hotels, retail and amenities that will exceed the high expectations set by MGM MIRAGE’s other Las Vegas properties. It began with a master plan developed by New York’s Ehrenkrantz, Eckstut and Kuhn (EEK) Architects for a high-density destination with interesting places and experiences, smooth public circulation and regard for its surroundings. To realize this plan, eight worldrenowned architects and two of the country’s foremost builders, Perini Building Company and Tishman Construction, worked closely together. Inside the buildings, an international team of top interior architects and designers provided comprehensive design extending all the way from the lobbies to the cutlery. MGM MIRAGE chose the architects with care after traveling the world to review their work and meeting with them personally to get a feel for their approach. For the two residential highrises that would become known as Veer Towers, Chicago-based Helmut Jahn, Architect was a natural: a firm whose buildings were certain to look unlike any other. 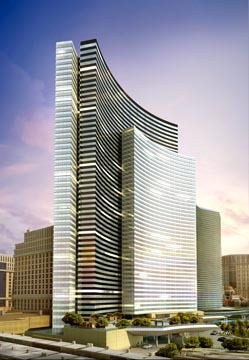 For the condo hotel that would become known as Vdara, MGM MIRAGE felt RV Architecture, LLC, led by principal Rafael Viñoly, was ideally suited to design a building that would complement the nearby resort casino properties. For the hotel and residences that would become known as The Harmon Hotel, Spa & Residences, MGM MIRAGE selected London’s Foster + Partners, a firm noted both for the thought-provoking modernity of its work as well as for its beautifully engineered, intelligent and efficient structures. For the hotel and residences destined to be home to Mandarin Oriental, Las Vegas, MGM MIRAGE turned to Kohn Pedersen Fox Associates. The New York-based firm is recognized for the excellence and innovation of its buildings in cities around the world. New York’s Studio Daniel Libeskind designed the faceted-roof retail and entertainment district at the heart of CityCenter, an international gathering place and premier shopping destination combining art, design and experience. Throughout its interior, New York’s Rockwell Group introduced a series of striking environments designed to invite and engage, intrigue and relax. 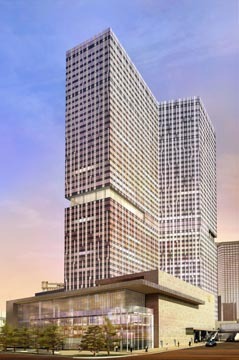 Soaring to 61 stories, CityCenter’s resort and casino was designed by the New Haven, Connecticut firm of Pelli Clarke Pelli Architects. Geared to incorporate natural lighting into some of its interior environments, the casino will reflect environmentally conscious thinking while setting a new global standard for gaming and leisure. To oversee the design effort, MGM MIRAGE turned to Gensler, the largest design firm of them all. Skilled at orchestrating international projects of the greatest scale and complexity, Gensler has helped to ensure a coherent whole. The firm also designed the CityCenter tram that serves as CityCenter’s primary transit system. A real urban district is varied, and CityCenter is no exception. Each building makes its own contribution to the whole. Together, they’ll shape the evolution of Las Vegas and become a global showcase of urban design. A chic condo hotel with a sophisticated international flair. A distinctive CityCenter location that balances the energy and excitement of Las Vegas with an exclusive, non gaming environment. An urban retreat that offers a full complement of services and amenities designed to inspire, pamper and indulge. With a name that evokes intimacy, luxury and a distinctive Las Vegas escape, this is Vdara, a new brand developed and operated by MGM MIRAGE. In designing this soaring 57-story condo hotel deep within CityCenter, New York-based RV Architecture, LLC demonstrates how to use a disciplined design approach to remarkable effect. From the outside, Vdara’s distinctive crescent shape and unique skin of patterned glass create one of the most provocative design statements in Las Vegas. At the same time, and at every level from the building as a whole to the interior of each residence, Vdara delivers both access and escape. Vdara’s approximately 1,543 residences feature open floor plans and horizontally oriented windows that offer expansive views of the city and mountains. Fully furnished and equipped turnkey residences are available in a variety of predetermined color palettes. Furnishings and materials selected by acclaimed interior architects and designers Brennan Beer Gorman Monk Interiors create stylish, contemporary environments infused with warmth and comfort. Residents may enjoy the studios, deluxe studios, one and two bedroom residences, as well as studio, one and two bedroom penthouses as primary or vacation residences. Ownership includes the opportunity to participate in Vdara’s managed nightly rental program. At Vdara, amenities and services are commensurate with a premier MGM MIRAGE property that enhances a unique focus on individual needs, tastes and desires. Vibrant social scenes at the pool deck, lobby lounge and destination restaurant bring excitement and interaction within. A salon and full-service wellness spa offer personalized pampering. A conference space is perfectly scaled to host executive groups and events ranging from 10 to 400 people. Residents and guests can choose from other amenities that include a gourmet coffee bar and grocery, fully equipped fitness center and in-room dining, banquet and catering services, to create their own ultimate escapes. Helmut Jahn’s design for the two residential high-rises known as Veer Towers is a masterful translation of energy and excitement into physical form: Its two 37-story glass towers shimmer day and night. With approximately 335 condo residences each, Veer soars above the rest of the city—and puts residents close to CityCenter’s retail and entertainment core. 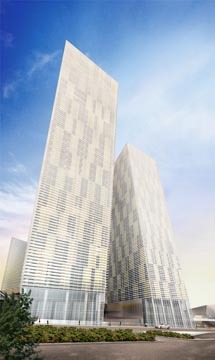 Inclined at five-degree angles— a feature celebrated by the project’s name—the towers seem to dance with each other. Of course, Veer isn’t about energy alone. It expresses an interplay of public and private spaces, proximity to the action and commanding views. Lobbies and public spaces have been developed by notable designer Francisco Gonzalez- Pulido to showcase impressive works of glass and metal with plenty of natural light. In the residences, the renowned team of Dianna Wong Architecture & Interior Design, Inc. has created modern spaces that impart a sense of openness. Streamlined with spa-style bathrooms, floor-to-ceiling windows, natural textures and finishes and a color palette that features a wide variety of neutrals, each space is the ideal haven for regrouping in time for more. For people on the go, Veer features a private valet and a fully staffed lobby to make smooth transitions. Veer Towers also offers a business center, recreation room and upper floor media room for films, sports and news as well as a fitness center for getting in shape for the city that awaits. Towering above it all on each rooftop, Veer features an infinity edge pool surrounded by a patio for relaxing and entertaining. From the outside, the colors and textures respond to the desert surroundings, bringing harmony and balance to an exuberant cityscape. Designed by the internationally acclaimed firm of Kohn Pedersen Fox Associates, The Residences at Mandarin Oriental, Las Vegas is a fitting front door to CityCenter. On the inside, each residence is the embodiment of taste and elegance, and sets a new standard for a stay on The Strip. Perched above the bright lights of the boulevard, on the highest floors of the building, are the approximately 227 residences of Mandarin Oriental, Las Vegas. For those select owners who are accustomed to the highest standards and expect them at all times, the penthouse collection at Mandarin Oriental, Las Vegas is a true limited edition. Seven distinctive penthouse floor plans reflect the taste, style and personality of the very few who will call this home. The Residences at Mandarin Oriental, Las Vegas upholds the Mandarin Oriental tradition of Asian-inspired service that anticipates and delivers. Owners can receive all the consideration and support of permanent guests. Whether working in the business center or meeting in the boardroom, lounging by the pool or relaxing in the spa, residents can choose from bespoke hotel services and amenities to complement their lifestyles. With The Residences at Mandarin Oriental, Las Vegas, privacy also meets privilege: separated from the hotel’s public spaces, residents are served by their own entry, through the porte cochére. Residential interiors have been crafted with studied, meticulous care by the distinguished design and architecture firms of Kay Lang & Associates and Page + Steele Interior Architects. Living spaces are characterized by an artful, Eastern approach, married with contemporary aesthetic splendor, in a decadent selection of color palettes, materials and finishes. The Residences at Mandarin Oriental, Las Vegas defines discernment. For the worldly guest accustomed to the best that life offers, they’re home. A new vision of what Las Vegas is becoming. A new high point in residential architecture and design. A new appreciation for what an urban destination can be. And a new level of access to the best of what Las Vegas offers. 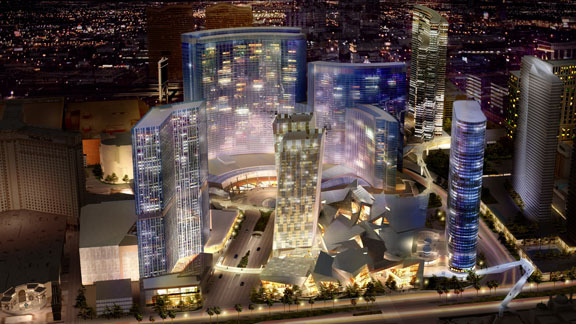 CityCenter is a remarkable moment in the life of Las Vegas. Make it a part of your life, too. Enjoy the best of Las Vegas as a CityCenter owner—through the exclusive CityCenter Owner Privileges Program. Benefit from priority access to the amenities and services of the MGM MIRAGE portfolio of Las Vegas properties—including those at CityCenter itself. Whether you want preferred seating at the most in-demand shows or choice reservations at the most talked about restaurants, the CityCenter Owner Privileges Program helps make it happen.